An unaltered photocopy of your DD-214, WD AGO, NAVPERS, NG or other military issued document clearly displaying your award of the USMC Security Guard Ribbon. 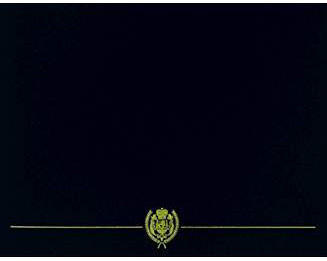 The Marine Corps Security Guard Ribbon was established on July 15, 1997, by Secretary of the Navy John H. Dalton. This ribbon will be awarded retroactive to January 28, 1949, the date the first Marine Security Guards departed Washington, D.C. for their overseas assignments. Only one award is authorized for the period of January 28 1949 to August 15, 1974, regardless of qualifying periods. Marines assigned to Marine Security Guard duty (Military Occupational Specialty 8151) are eligible upon completion of twenty-four months service at a foreign service establishment. Subsequent awards will be made for every 24-months served, either consecutively or cumulatively. 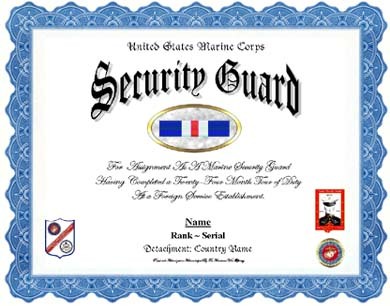 Marines who serve successful tours at a lettered company headquarters within MSGBN or HQ MSGBN, Quantico, are not eligible to receive this award. Posthumous awards may be made without regard to period of service. This ribbon is worn after the Marine Corps Drill Instructor Ribbon and before the Armed Forces Reserve Medal. Second and subsequent awards are denoted by bronze stars three-sixteenths of an inch in circumscribing diameter.